If you haven't seen Katrina and Siobhan's Anniversaries of the Heart finishes - you must go now!! They are both amazing! They inspired me to get back to mine. I'm getting closer to being finished with the June Block (block number 7). Nicole, I just love AotH. Yours is looking great! Gorgeous! I saw those finishes and actually thought to myself...I bet Nicole pulls hers out again :) Funny how we get to "know" our fellow bloggers and we've never met most of them! Just gorgeous! I so need to get working on AotH! I don't know if I have enough ancestors to people the blocks though. lol! AotH is absolutely wonderful, Nicole! You'll be done in no time and what a treasure you'll have. I have seen the finishes and they are wonderful! Hurry up and get yours done too! I NEED to see it. LOL!! Great progress Nicole! I am still stuck on the 4th block! I think I need to set mine aside for a little bit. Love your personalizations! Awww, thanks Nicole!! :) Your AotH looks GREAT! Nice progress. So pretty Nicole! I'm starting to consider stitching these myself, as everyone's WIPs and finishes are gorgeous. Your AotH is coming along nicely! I just love how everyone is personalizing theirs! Wonderful lazy daisies! Now I'm sorry, after seeing your AotH and Katrina's and Siobhan's, that I didn't stitch it. 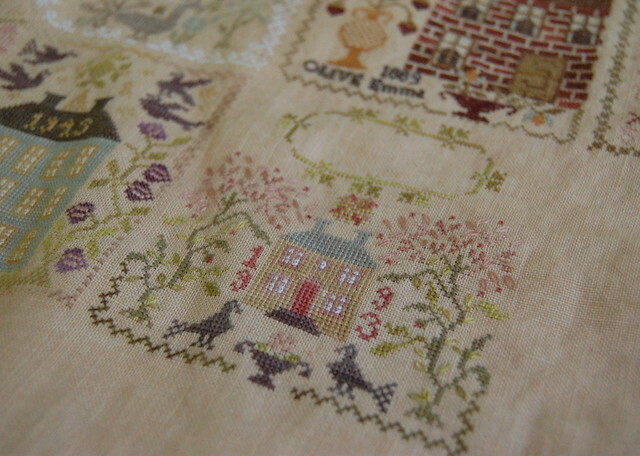 very pretty, and I saw the other finishes as well - they make me want to go and buy them for myself to stitch! Your AotH is wonderful - talented work !!! I just loved the project and yours is gorgeous too. Thanks for mentioning mine, I am glad I helped inspire you :-). Just lovely Nicole, I will duck over and have gander at the other two, love this series. I know I am LOVING seeing these finishes pop up. What a great story about you and DH--rare that a young marriage lasts like that--big congrats to both of you! Soooo beautiful, Nicole! Every time I see your stitching, I long for my stitching couch. Gorgeous progress!! Hello Nicole!! I saw your comment on The Spinster Stitchers blog and just had to find you to thank you for the link to Evernote. I LOVE the program, and it is clearing soooo much junk off my desktop! Now I just have to remember to view it every day, LOL! I see you stitch repros!! Love your stitching...I must now obsessively read every post! So lovely! I'm quite impressed by the AotH and of all who stitch it. Its quite the large project and very stunning when it is completed! I concur - theirs are beautiful, as is yours! Just wait, before you know it your children with be half your age! Nicole, I know your AofH will be just as beautiful as Katrina's and Siobhan's. Can't wait to see yours finished. Your AoTH is looking great, nice progress.